If rain is considered good luck, Aurora’s incoming Microtel Inn & Suites by Wyndham will soon be a goldmine for investors and visitors alike. Dignitaries gathered under umbrellas Monday evening to formally break ground on the new hotel site, which will be constructed at 180 Goulding Avenue just south of Leslie and Wellington. A partnership between Wyndham and MasterBUILT hotels, principles of the project have set a 12 month target to finish the 108 unit building which will be complete with an indoor pool and waterslide, fitness centre and conference facilities. MasterBUILT started looking at the possibility of bringing a hotel to Aurora as early as four years ago, said Mr. Watson, but back then the company encountered a stumbling block which was recently removed. 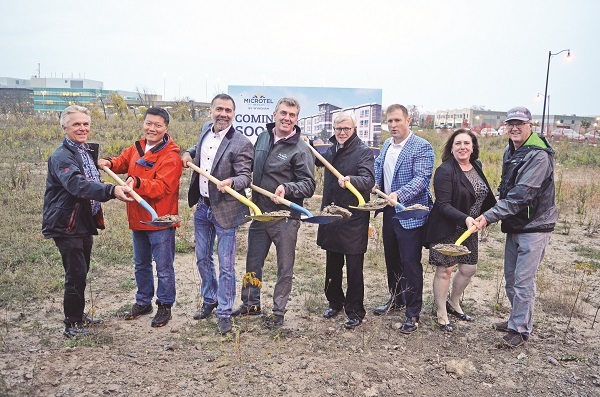 Mayor Geoff Dawe, who took part in the groundbreaking along with Councillors John Abel, Harold Kim, Tom Mrakas, and Michael Thompson, was on the same page. He praised the efforts of Town Staff in identifying what were seen as exorbitant development charges (fees that are paid by incoming developers to a municipality to account for growth) as a significant problem in attracting new hotels to York Region. Council took the ball and ran with it, bringing that message to York Region, where change ultimately came about. “[Staff] first came to our Council in 2015 with a proposal for the Town to look at its development charges and then, as Eric mentioned, we managed to leverage that up to the region for the Region to do something with their development charges,” said Mayor Dawe. “That kick-started a few hotel developments across the Region and I am quite pleased we were able to get that going.